With wife Victoria away at New York Fashion Week, David Beckham decided to treat super-cute kids Brooklyn, Romeo and Cruz to a boys day out, indulging in some fun father-son time with a trip to the football. SEE VICTORIA BECKHAM’S BRAND NEW DRESS COLLECTION! 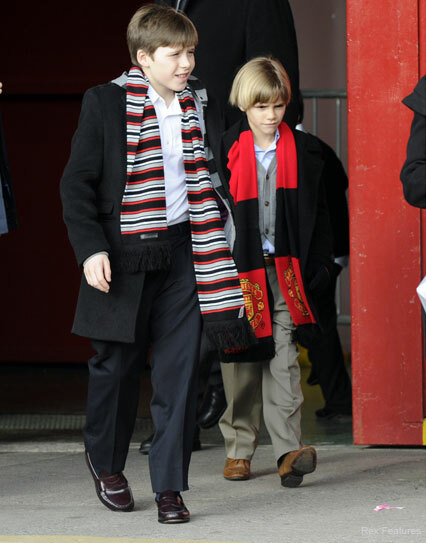 The Beckham boys began their day at Manchester United ground Old Trafford, where they stopped off in a VIP box to watch Mr B’s former team play rivals Manchester City. But at the end of the festivities, it seems the Beckham boys had enjoyed their family day out so much, they didn’t want it to end. While grown up twosome Brooklyn and Romeo – complete with football scarves and hats – were happy to make their own way back to the car, little Cruz was not on best behaviour. The cheeky five-year-old was carried out of the stadium by his doting dad, but kicked up a fuss when David tried to put him down, refusing to put his feet on the ground. Luckily David saw the funny side, grinning at his troublesome son as he bundled him into the car. 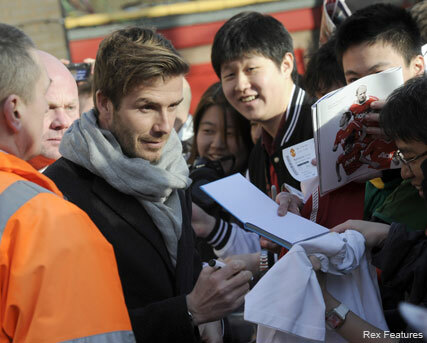 The sporting star then stopped to sign autographs, before whisking the trio away. Today, it’s thought David could already be on his way out of the country. Rumour has it the dad-to-be is planning to fly out to New York to surprise pregnant wife Victoria, to celebrate the success of her fashion week show, and whisk her off for a romantic Valentine’s date.